I've been playing bass for 30 years now and have probably done something in the region of 600 gigs and I have predominantly played a Jazz bass because they have felt the most comfortable for me. Mostly because of the neck but also pick up placement, balance and tone. I would happily play a Precision but they have always felt a little more cumbersome with the necks not so comfortable and my playing would suffer. I would always come back to a Jazz which felt like putting my favourite trainers back on. However, over the last year, I'm beginning to find Jazz necks too thin and a little uncomfortable to play. My hand feels cramped when fretting as the neck feels too thin and narrow. 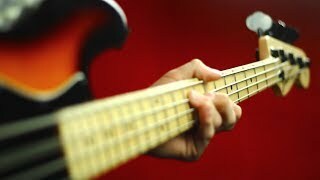 I have always used all four fingers when fretting and play a lot of walking bass lines but I have noticed that using my little finger to fret is harder on a Jazz bass as my hand feels more squashed. I feel like its now harder to have my fingers flat across the board covering the frets as my hand is closed more because of the thinner neck. My fretless jazz I now find really uncomfortable to play. So I have been playing my 70's Precision a lot more and I am having no such trouble. It feels comfortable and no issues with fretting. I also have a Mike Dirnt Precision which is famous for having a very chunky neck and it feels very comfortable to play if not the most comfortable. I don't think anything has changed in my technique, I'm still playing walking bass line and the same stuff as I always have. I don't think anything has happened to my hands as playing the same stuff on a Precision is no problem, its just that Jazz necks are now feeling too thin and narrow and a little uncomfortable. I don't really know what else it could be. Has anyone else had something similar? I would assume that something has happened to your hands, probably something age related as unpleasant as that sounds. However, doesn't seem to cause you an issue as long as you have recognised it and done something to sort it out, ie, changing to a P bass. Yup, I used to play a Jazz when I started and was always after thin necks on other basses because I thought they made me play faster. Over the years I have found that I don’t cope well with thin necks, I get bad cramp and feel like my fingers get on top of one another and almost trip over themselves. One of the reasons I struggled with 5 strings was because the spacings on a lot of them were too tight, then I found 5 strings which had ‘normal’ 19mm spacing and I moved to them exclusively for nearly 10 years. I absolutely adore the classic 50s precision necks, which are almost as big as a stingray 5 but width and find them incredibly comfortable. I’m currently on a Stingray which is a nice nut width and not too deep and find that a good fit. I would love a Jazz as they always appealed to me visually, but I would have to build a bitsa or a custom order with a precision neck to make it playable for me. I also keep my eyes peeled for the elusive 2001 Fender PJ Hotrod which I would love. I’ve never got on with the jazz bass neck - too narrow and thick, also I find the offset body to be uncomfortable. A precision has always felt right - although I appreciate both models have had a variety of different nut and neck widths. Personally speaking it think I comes down to how long your fingers are from tip to first joint - if you have fairly small hands then a wide precision neck can feel like a real stretch. If however you have longer fingers then a jazz can feel cramped. I agree that tastes change over time - I used to like wide spaced 5- and 6- strings but are now much happier with a narrower bridge spacing and regular nut width (e.g. Ibanez). Everyone ends up with a Precision. It may take decades. But we all get there at some point. Took me about 25 years! Preferences change. Time to start looking at other basses. Or just put a P neck on your Jazz bass. I'm wondering if Woodinblack is on to something here and something has changed with my hands, be it age related. Just seems very weird that for years I've played a Jazz with no problem and now I find them less comfortable. Yet I can still play what I have always played but on a Precision which before was less comfortable for me. Maybe my fingers are less flexible and prefer to be more open and flatter that I get with a Precision neck. I went the other way - originally played P-basses and Stingrays, and then had to find a lighter instrument following a shoulder injury. Have now ended up with Fender Precision Lyte(s), which contrary to the name have a very slim jazz style neck which previously I found way too small. Having used them for years now, I probably would struggle going back to the larger neck profiles I always preferred - weird innit? Bit sad as I love my P-bass and really miss my Stingray too. That's a very good question. I'll take notice of my playing over the next few weeks and see if its different. I'll also see if there is a difference from when I play a Jazz and a Precision. Just off the top of my head, I'm wondering if I'm unconsciously keeping my thumb at the back of the neck with the Precision and putting somewhere else on the Jazz as it feels thinner. I'll have a check. The first picture is where I end up on gigs when I’m on a jazz. You can clearly see it’s technically weaker, but the only way to make it comfortable. If I use the thumb behind technique (as in the P bass image) on the jazz it’s superemely uncomfortable after only a short while, but tonally sounds way better. I'm wondering if Woodinblack is on to something here and something has changed with my hands, be it age related. I think sometimes we are reluctant to think that things change when we age and adjust to it. I have recently change how I always sat with my leg up because it occured to me that it was uncomfortable, wheras I used to sit that way because it was more comfortable. Sometimes rather than wondering why it might be worth accepting it and moving on. Maybe later on it will happen to me so I can finally try all these basses with over 16.5mm spacing that people seem to like! Doesn't' that watch dig in? It looks uncomfortable! I used to wear a metal Milanese loop band all the time, and that was occasionally noticeable for its dig-factor, but generally okay. This band gets most everyday wear now, mainly for not scratching up my laptop and being not too noticeable. Put your old Jazz in for a service, set up and possibly a fret stone. It'll come back feeling, playing and sounding like it's in another league. Could you have the start of trigger finger? I've just read all the symptoms and I don't seem to have any of those conditions or anything similar so I would say not. Maybe its old age although I don't think 48 is old but you never know. The middle knuckle on my middle finger very occasionally hurts which I am putting down to perhaps the start of arthritis or inflammation. I have no issues with movement or strength and it doesn't affected playing or mobility (I can play everything perfectly still) and I am not in any pain but I just notice it occasionally. It might even be over-worked from doing 119 gigs last year but if so then why just the middle finger knuckle and why only occasionally. Its not hurting now for example. Have you recently changed your practice routine? Specifically have you started to practice sitting down more than you used to? I ask, because I have. And I feel my technique when standing up (and the different angles I play at in result) feels a bit odd.. Which I blame on the bass, but it might not be. I went maybe 15 years with almost no home practice, so I pretty much always played standing up at gigs and rehearsals. Not a daft theory. A change of position will affect how it feels and how your body reacts. Re the OP, it could be age-related, or injury-related, or something else entirely. Do you have any nerve or cervical disc issues? This can affect your hands, even if the hands themselves aren't a problem. Due to various spinal issues I started to have problems playing certain types of basses in my late 30s, having previously had no problems with anything. That's progressed so that now (55) there are very few basses I can play. In fact at the moment, I've limited it to my Rics, which are the only basses I can really play more-or-less pain-free. A jazz is one of the worst for me. The offset body causes me crippling pain in my right arm, no matter what I do or how I position it, and I can't float the arm due to my cervical disc problems. I sold a backup Squier P the other year because I was experiencing hand and arm pain every time I used it. I even had to sell an Ibanez SR because it left me in agony. With some basses it's the left hand, some the right, some both. What I would say is that if it continues, it may be worth seeking professional help. It may also be worth biting the bullet and giving up using the Jazz altogether, or at least until you've identified the cause.